This page provides several terms used in color theory, so hopefully this glossary will get you up to speed on color and the major terms used to describe color. The terms are listed alphabetically below. Achromatic: This refers to black, white, and gray, each of which is without color or hue. Additive color: In additive color, the primary-light colors of red, green, and blue are mixed. When these three colors of light are mixed or “added” together, white light is the result. The absence of all colored light is black. When primaries overlap one another, the additive secondary colors are produced: Red light overlapping with blue results in magenta (bluish red), red overlapping with green produces yellow light, and blue light overlapping with green light produces cyan−a greenish blue. After image: When the eye focuses on an intense color for as few as 30 seconds and then focuses on a neutral area, the complementary color appears in the same pattern as a ghostly afterimage. Afterimages can be reduced by varying the intensity of colors placed together, by separating them in distance, or by carefully handling strong graphics and patterns. A stark white background is more likely to create an afterimage than neutralized color or a gray. A strong chroma of a hue will bring the complement into the visual area, which will be seen in the neutrals. Varying the value of colors will also reduce visual discomfort. Analogous: Analogous color schemes result from two or more colors adjacent to one another on the color wheel like blue, blue-green, and green: Commonly, three to four colors constitute a pleasing analogous scheme by allowing a wider range of colors to harmonize. Any less or any more color can be monotonous or overwhelming. Chroma: Chroma is how pure a hue is in relation to gray. Chroma refers to the purity of a color, completely absent of any white, gray, or black that would lessen its intensity or saturation. Chroma or intensity is the amount of pure chroma in a given hue. Chromatic: This refers to all colors except black, white, or gray. Color extension: Color extension is often used in interior design. This is when you have a picture of a room and show a swatch of all the main colors being used in the room and the approximate percentage of each. Color spectrum: Colored light consists of a series of wavelengths, eachvarying in length and strength. The colored light we can see is called the visible color spectrum. Violet light has the shortest wavelength (390-455 nanometers) and red has the longest wavelengths (622-780 nanometers). The visible color spectrum is the portion of colored light within the electromagnetic spectrum visible to the human eye. The human eye is capable of seeing a very small portion of the electromagnetic color spectrum. Composite color: This is a color that is made up of two or more colors. Complementary colors: Complementary colors result from two colors opposite one another on the color wheel red/green, blue/orange, and violet/yellow. Cool colors: These are blue, violet, and green They are associated with calm and restfulness. Cool colors suggest restraint, dignity, and formality. They would, therefore, be supported by applying curvilinear and organic lines. Double complementary: This includes two adjacent hues on the color wheel and their complements on the color wheel. An example of a double complementary color scheme is yellow-green, green, red-violet, and red. Dyadic harmony: A dyad is a color harmony made up of two complementary hues. The colors in a complementary dyad are diametrically opposite each other on the color wheel. Earth colors: These are colors like those of soil or earth. These include brownish-reds and browns. Grayed color: These are colors in which gray has been added; they are colors that are neutralized or grayed. This is another term for a tone. Hue: Hue is the color’s name off the color wheel, like blue-green, red, or yellow-orange. Intensity: This is the brightness or dullness of a hue. One may lower the intensity of a color by adding white, black, or gray. Luminance: Luminance is the measure of the amount of light reflected from a hue. Those hues with a high content of white have a higher luminance or value. Luminous color: Luminosity is generally understood as a measurement of brightness. Luminosity is the saturation of the hue (bright/dull, light/dark). Monochromatic: A monochromatic color scheme is based on variations of a particular hue. The monochromatic scheme is created by creating variations of a single hue by adding varying degrees of white, black, or gray. Nanometers: Nanometers is the unit used to describe and measure the wavelengths of visible light. Primary colors: These are red, blue, and yellow. 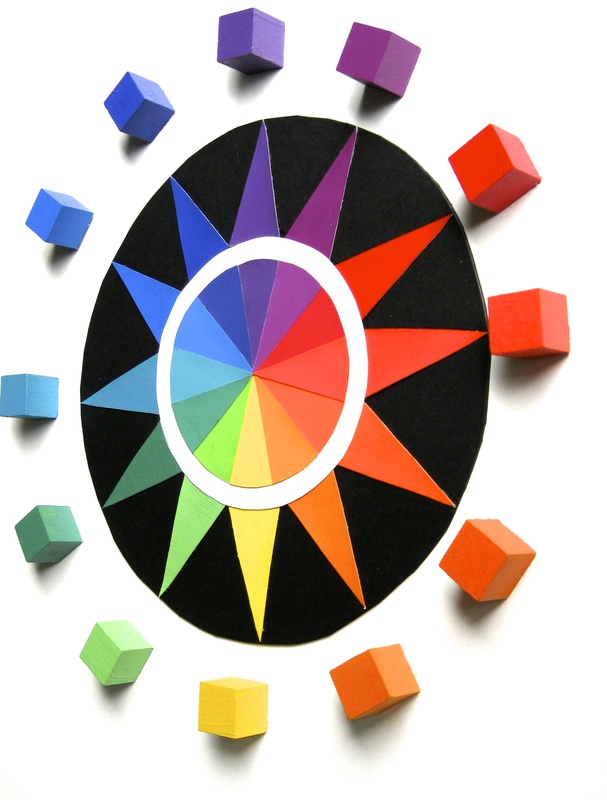 Each primary color cannot be produced by any combination of the three. Pure hue: This is a color void of any white, gray, or black and is at its highest intensity or brightness, such as red or blue. A pure hue cannot get any brighter or more intense. Saturation: This is the degree of purity of a hue. Saturation is another word for chroma. Secondary colors: Secondary hues are violet, green, and orange, each of which is made by combining two primary hues. Shade: A shade results when adding any amount of black to a color. Physically or visually adding varying amounts of black to any pure hue reduces the color’s intensity. Simultaneous contrast: Simultaneous contrast results when two equal values create a “vibrancy” effect or strong contrast that occurs around the edges around the edges where the two colors meet. This is rarely used in design, and in commercial spaces because it can be a disturbing visual effect. Simultaneous contrast occurs when any two colors are placed side by side or surrounded by one or the other resulting in a change is the colors’ visual perception. This effect is intensified with complementary colors of high saturation or brightness and chroma. Simultaneous contrast is most evident in pairs of intense, high-chroma complementary colors of equal value placed in juxtaposition: A vibrating or moire afterimage appears where they border. This can cause eye-focusing problems, irritation, and headaches. Split complementary: A split complementary color scheme is similar to the complementary scheme. It’s composed of three colors consisting of one main hue plus the two hues that are adjacent to its complement. An example of a split complementary color scheme is blue, red-orange, and yellow-orange. Subtractive color: Subtractive color applies to paint, dyes, colorants, and inks. Subtractive color is used in printing. It is used where blue, red, and yellow are identified as the primary colors. Using subtractive colors, the primary colors can be mixed together to achieve black. Successive contrast: The 19th-century physicist Michel-Eugene Chevreul’s second law, of successive contrast, refers to the optical sensation that occurs when a complementary color halo appears gradually to surround an intense hue. This complementary glow is superimposed on surrounding weaker color. A successive contrast occurs when, after one has stared at a red surface, a green surface looks much brighter. As one enters a dark room from bright sunshine, the room at first seems quite dark by contrast. A simultaneous contrast occurs when an area of brightness is seen against a less intense or a more intense background. Tertiary color: These colors are made by adding a primary color to a secondary color. The six tertiary colors on the color wheel are yellow-green, blue-green, blue-violet, red-violet, red-orange, and yellow-orange. Tetradic color schemes: Tetrad color schemes are composed of two sets of complementary colors. It is another phrase used for the double complementary color scheme. The tetradic color scheme scheme is the richest of all the schemes because it uses four colors arranged into two complementary color pairs. This scheme is hard to harmonize; if all four colors are used in equal amounts, the scheme may look unbalanced, so you should choose a color to be dominant or subdue the colors. An example of a tetradic color scheme is yellow, red-orange, violet, and blue-green. Tint: Adding any amount of white to a color produces a tint. The more white is added, the lighter the tint. Tone: Adding gray mixture (any mixture of white and black) to a color produces a tone. The more gray is added, the stronger the tone. Triadic harmony: Triad color schemes are composed of three colors equal spaced along the color wheel such as yellow, red-orange, violet, and blue-green. Undertones: Undertones can render any color cool, even if it is warm. It can render a color more warm or cool. Value: Value refers to relative light and dark in a sample. hue is circular and continuous, but value is linear and progressive. Value is a series of steps from black to white. Warm colors: Warm colors include red, orange, and yellow. They are stimulating, friendly, cozy, and inviting.